Goodbye gut feelings. 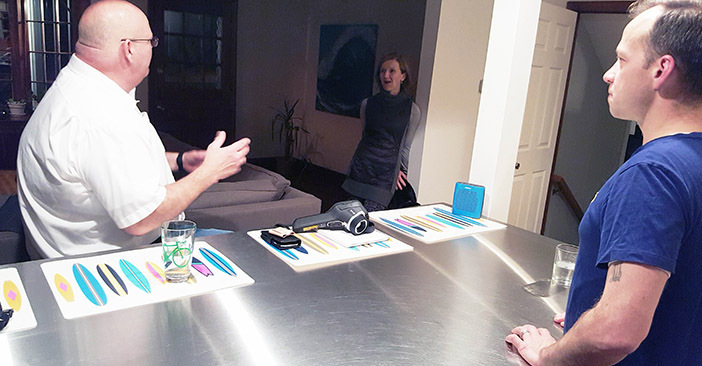 New state-of-the-art tools are giving homeowners data-based insights into what’s driving energy loss in their homes. Imagine x-ray vision that can see through walls and identify areas of heat loss or find hidden water damage, air readings that give you a real-time look at your air quality. Imagine making educated home improvement decisions based on real science. It’s out there, the little-known world of building science. While it’s currently being embraced mainly by lawyers and energy companies, this technology has real potential for homeowners. It’s a world homeowners’ Megan and Chris Scott-Hancock got a sneak peak of when CertainTeed building scientist Lucas Hamilton toured their Michigan ranch. Megan Scott-Hancock won the privilege as the grand prize winner of last summer’s CertainTeed Dream Holmes Sweepstakes. First there’s the little black box (literally) stuffed with sensors and circuitry that measures a range of data points from sound levels to light levels. It can even compute a room’s relative humidity all by accessing a myriad of data points while resting innocently on the counter. Then there are the infrared guns that measure heat readings. Quickly identifying areas of heat loss, turning up clues of moisture build up and possible leaks hidden inside the walls – and of course, most deadly of all, the knowledge of the scientist himself who can quickly aggregate all these data points into actionable solutions. Air quality is an underappreciated concern. #1 Carbon Monoxide (CO) issue in America? Dryers located too close to a furnace or water heater that is naturally vented. A naturally vented appliance exhausts without the aid of a fan. This makes it is susceptible to back-drafts created by the big fan of the dryer. A better option would be to direct vent the HVAC system so this can’t happen. 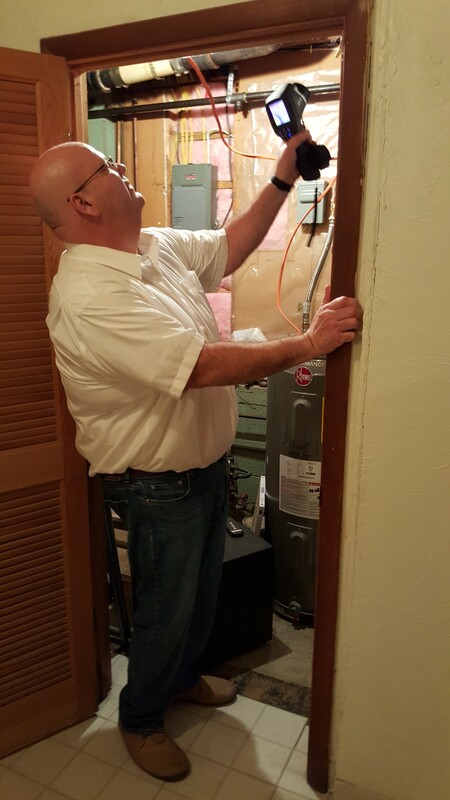 Make sure your contractor is aware of existing appliances and how they vent before new systems are installed. Unsealed joints in your HVAC duct work are costing you money. To identify potential leaks try this simple building science test. Lick your finger and feel for escaping air. If you feel air, you have a critical breach in the efficiency of your heating system. Fortunately the solution is fairly simple – seal the joints with duct mastic or duct tape found at a mechanical shop (not to be confused with Duck tape). How to ID moisture in a finished wall. When infrared imaging turns up a darkened area with a bell-shaped curve, particularly under windows and roof lines, this is an indication of possible water damage. While most of the house showed no signs of moisture there was one window that gave Hamilton pause. The coloration wasn’t extreme and it might be nothing or it might be the early signs of a leak. To help determine if this was an area of concern Hamilton recommended watching for signs of moisture build-up and to sniff the outlet. A musty odor can mean the presence of mold or mildew, a sign of bigger problems. Let your projects do double duty. The infrared cameras also identified a lack of insulation in the Scott-Hancock’s exterior walls but instead of ripping down all the walls in the home Hamilton suggested they wait until they re-side their home. Adding an insulating sheathing between the siding and the exterior wall or selecting a siding with a built-in insulating factor like CertainTeed’s CedarBoardsTM insulated siding will allow the Scott-Hancock’s to build up their home’s efficiency without tearing out the walls. After an enlightening look behind the walls of their home, the Scott-Hancock’s were left with a final report and a punch list of improvements they could make over time. In time, hopefully this will be an experience available to all homeowners but for now, it helps to know someone and fortunately, we know the best. 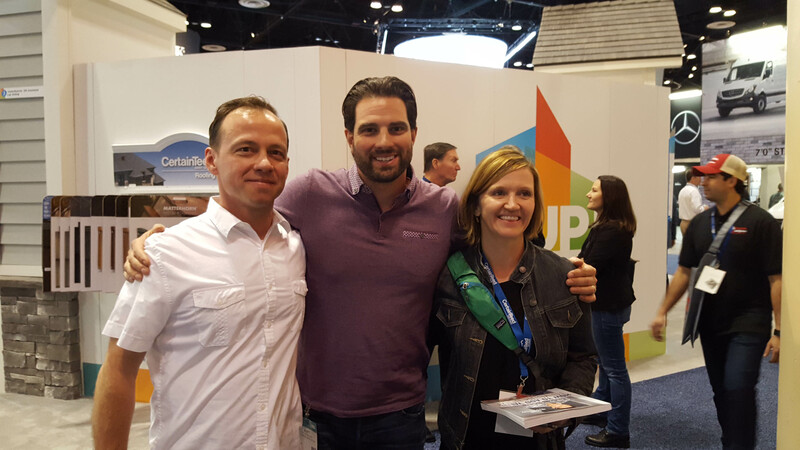 Oh, yea, and they got lunch with HGTV-star Scott McGillivray, too!